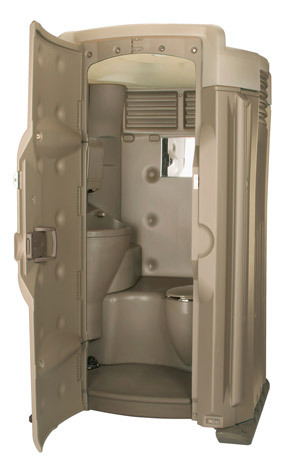 Structurally, the High Tech II is wider than a standard restroom to accommodate all the amenities. For sanitary reasons, the hand wash station has its own separate fresh water reservoir while the fresh water for flushing is stored in the base. A double-walled cap-style roof, twin-sheet side walls and the added support from the internal components produce an incredibly strong restroom, able to withstand constant use and still maintain its elegant look.